Doha, QATAR – Qatar Airways is the Official Airline of the Qatar ExxonMobil Open 2012 tennis tournament taking place in Doha from 2 - 7 January 2012. Widely acclaimed as Qatar’s most prestigious Association of Tennis Professionals (ATP) event, former World No.1 players Rafael Nadal and Roger Federer will take centre stage and battle it out on the courts of the Khalifa International Tennis & Squash Complex in Doha. The strong line up of players also include other top notch players from around the world like the former defending champion, Nikolay Davydenko of Russia. Last year, it was Roger Federer who clinched the title after defeating Davydenko in straight sets. With the line-up of top-seeded players in this year’s tournament, tennis lovers are in for yet another season of superlative tennis. 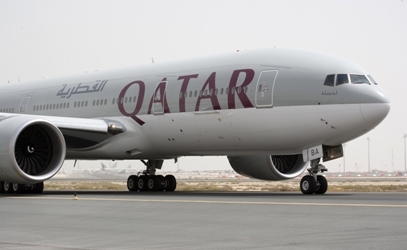 Qatar Airways Chief Executive Officer Akbar Al Baker said that the airline is delighted to bring the world’s best players to Doha for what is one of the most prestigious sporting events in the country. “Qatar Airways is proud to be a long term sponsor of this world-class event which has been so well-received among tennis enthusiasts and fans around the world. Nasser Al Khelaifi, Qatar Tennis Federation President said: "the Qatar Tennis Federation is proud of the long-standing association we have had with Qatar Airways. It is through partnerships like this that we can bring world-class tennis to the country as well as develop and foster the growth of players from Qatar." Qatar Airways has a close association with two major tennis tournaments in Qatar – Qatar ExxonMobil Open and the Qatar Ladies Open.